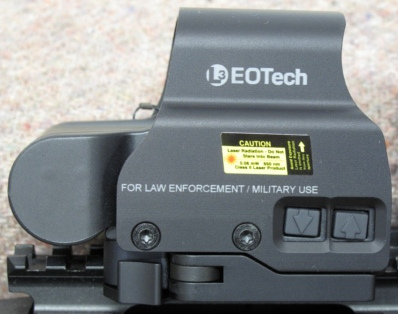 Make sure you read the EOTech - 1 page on the refund program. 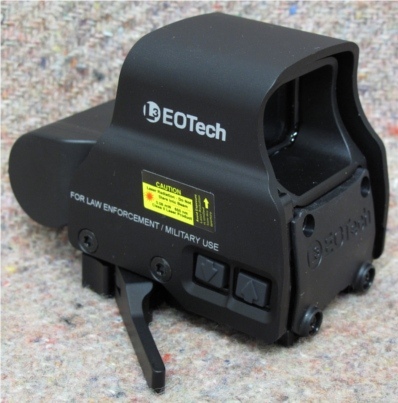 I upgraded my EoTech to an Exps2-2. 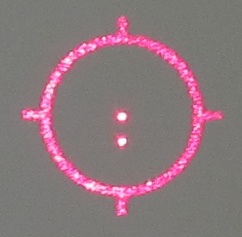 The reticule is composed of a 65 MOA circle and 2 aiming dots. These dots are calibrated for the ballistic drop of .223 caliber ammunition. The flip up iron sights cowitness perfectly with this model. Controls on the left side control the reticule brightness. The down arrow: reduces the reticule brithness. If the sight is turned on by pressing this button, it will automatically shutdown after 4 hours. The up arrow: increases the reticule brithness. If the sight is turned on by pressing this button, it will automatically shutdown after 8 hours. 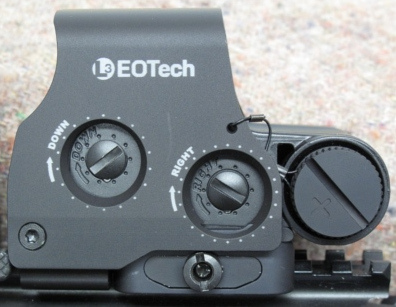 Both the down and up arrow: turn off the sight. Controls on the right side are used to move the reticule for zero. One click is ½" at 100 yards (½ MOA). Notice the transverse battery cover. The Exps2-2 uses a quick detach lever instead of the large screw on the 557 I used before. Magnification can be used or not. Not a mirror, nothing is seen from the front of the sight. There are no moving parts, only elevation and windage ajustment turrets. Unlimited eye relief (if magnifier flipped to side). The mount using a quick detach lever is much better (IMHO) than the screw used on the 557 model.